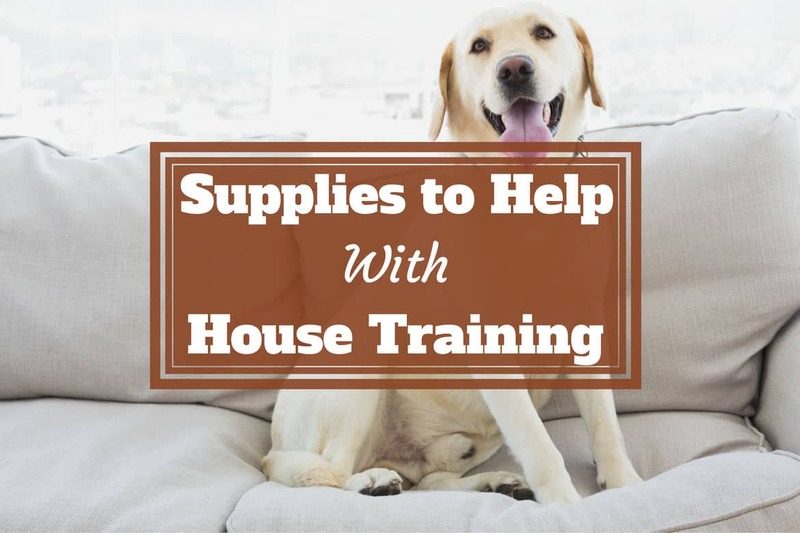 To make the house training process go as quickly and smoothly as possible, there are products and items that you’re going to need. In this article I list those items, how to use them and why. Depending on the method of house training you choose you may not need them all and I shall discuss when an item is or isn’t needed below. You already know that the most essential tool is you, your dedication and patience. However, the many house training products, supplies and equipment that the pet industry has developed over the years can truly make the task easier and certainly a lot cleaner. Dog Poop Bags And A Pooper Scooper. House Training Treats – Food Rewards For Doing It Right! Finally, The Most Important Tool Is You. 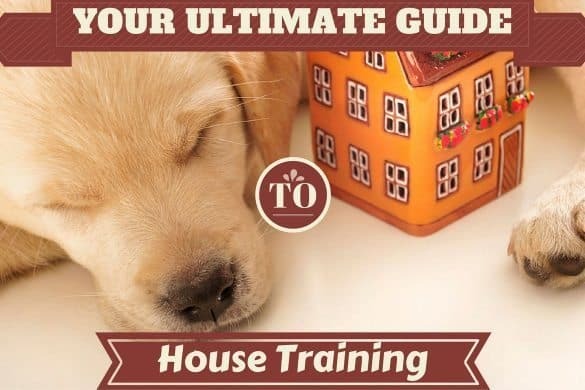 Read on to discover why each item is of high importance and how it helps the house training process. When you take your puppy to their chosen bathroom spot, the last thing you want is for them to wander off and get distracted, forgetting what they’re there for. You want them to keep their mind on the job at hand. In order to achieve this you need to have some control over their movement and for this you’ll need a leash and collar. With a leash and collar you can snap it on to take them to potty at their scheduled times and by restricting their freedom of movement it cuts down on their ability to go in the wrong place. This speeds up their learning of going in the one correct spot and not elsewhere. Also, if your puppy is able to wander off and get distracted, potty breaks can take many more minutes than they necessarily have to which you really don’t in the middle of winter! You’ll be pleased to have some control over them then. Read how to choose the right collars for your Labrador for advice on buying the correct size and type of collars. Read how to choose the right leashes for your Labrador for advice on buying the correct size and types of leashes. What do I use? I’ve always used a slip lead for house training purposes. A slip lead is very easy to use and importantly it’s very quick and easy to get on and off your puppy. There’s also no need to replace it as your puppy grows because it adjusts to all necks unlike most collars. The only time I don’t recommend a slip lead is if you have a real puller when on leash. Please be mindful of this as there’s potential to cause harm. You need to train your puppy to accept a leash without pulling before using a slip lead. The quickest and smoothest way to a house trained dog or puppy is to use a mix of supervision and confinement. You reward your puppy for pottying in the correct place and at the same time prevent them from pottying in the wrong place, especially on floors inside in your home. When you supervise your puppy, you concentrate on their behavior and when they do their little pre-potty routine you’re there to see it and can scoop them up and take them to their bathroom spot before they eliminate. When you cannot supervise your puppy, you can confine them to a crate to take advantage of their natural instincts to not soil in their den. By crating them you remove their ability to sneak away and toilet where they shouldn’t. 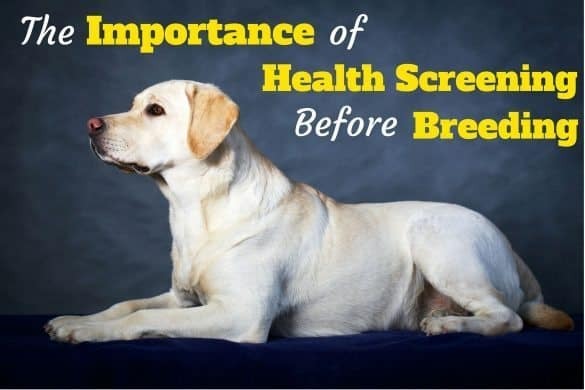 But just as importantly, because they will try their hardest to never soil in their crate you help them to build their bladder and bowel control. These two facts will have a dramatic effect on your puppy’s speed of learning and will benefit you both greatly. For those that are worried, read how using a crate isn’t cruel and is very beneficial to a dog for many reasons...As long as you crate train them effectively and only confine them sparingly and when necessary. Click here for a detailed guide on choosing the right type and size of crate to buy. 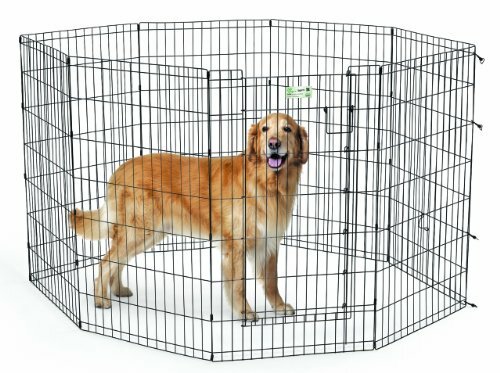 And when you’ve made your purchase, in the following article you can learn how to get a crate prepared for your puppy. Additionally, you can find instructions on helping your puppy learn to love their crate by reading this step-by-step guide to crate training your puppy. 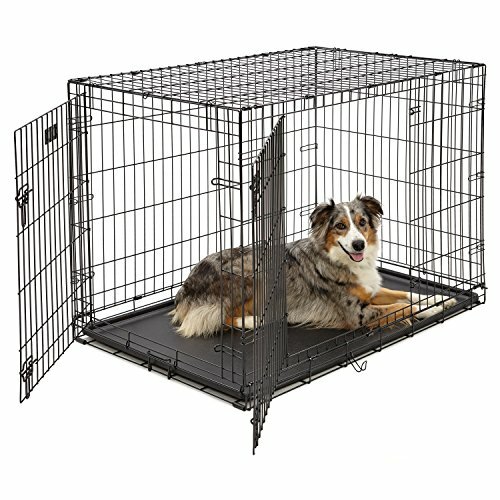 Finally, here is a write-up on using a crate to house train your puppy. Essential information if you’re going to use this method. An essential aspect to effective house training of your puppy is to prevent them from toileting in places where they shouldn’t. The best way to do this is to initially restrict their living space to just a small area and gradually expand that space over time when they can be trusted. If you let them have full run of your home right away, you’re letting yourself in for a world of trouble and could be finding (or not finding but just smelling) urine and feces in all hidden corners of your home. Also, a spot they’ve used before they will likely want to use again as they’re attracted there by the smell. So you want to provide a small enclosed space which limits the number of spots your puppy could potentially use as a bathroom spot and train them not to eliminate in this small area while encouraging them to go where you’ve chosen. All this makes your training task easier and the smaller space is easier for you to keep clean in case of accidents too. So how do you restrict a puppy’s living space? By use of either a puppy play or exercise pen, or by using a pet barrier (similar to a baby gate) to close off a single room for them to initially live in. 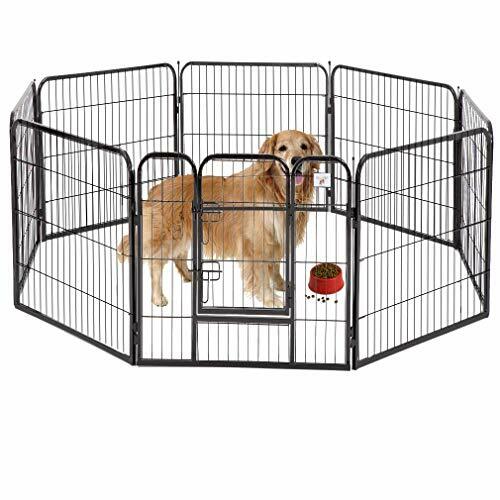 A puppy play pen, or exercise pen is a strong and durable wire enclosure you can use to restrict and contain your puppy in a small and safe place. It’s main use is for somewhere you can place your puppy for short periods when you can’t keep your eye on them. But it’s also for when you have to leave the home for a long time and need to create an area large enough for puppy to sleep and play in with an area for a bathroom spot to place puppy pads. It should be tall enough so that the puppy cannot climb out of it and it’s a very good idea to lay a plastic tarpaulin sheet under the pen and cover the floor with paper so any accidents are easily cleaned and it keeps your floor underneath spotless. This exercise pen is for longer term use, for large puppies or for adult Labs. It has 8 panels and can be set up in various shapes (rectangle, L-shape, octagonal) and easily folded for packing away when not being used. Highly recommended! Click to learn more / buy from Amazon. This pen is perfect for occasional and light use being less heavy-duty than the one above. 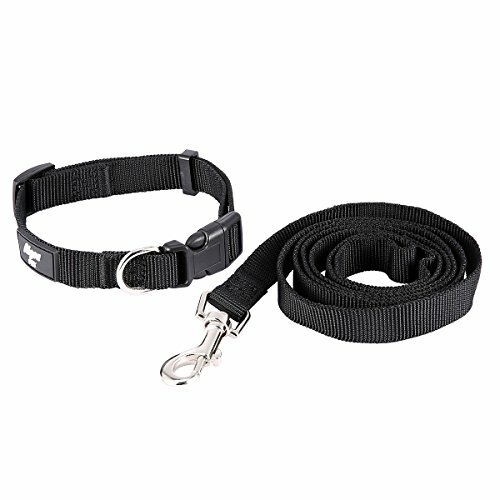 Suitable for young puppies only as adolescent and older dogs will easily escape it. But being so light, it’s so easy to set up and break down quickly to keep your puppy out of trouble when you’re busy at home. Very convenient. A pet barrier is just like a baby barrier or the gate you place at the base of stairs that we’ve all seen before. And it has exactly the same purpose. You use a pet barrier to confine your puppy or dog to one particular room only, or to restrict access from a particular room. A pet barrier is most useful for when you have to leave your dog alone and it would be too long to leave them in a crate, and of course for restricting living space initially until you can trust them and expand the area they’re free to roam. If you restrict them to one easy to clean and highly puppy-proofed room like your kitchen or bathroom, they will be unable to cause any damage in your absence and importantly for house training, will be unable to soil any of your expensive carpets or rugs. This security gate is perfect for Labradors as the extra height is needed to successfully secure them – A Lab can jump most shorter gates! Easy to close by simply pushing the door, no fiddly latches to work with. 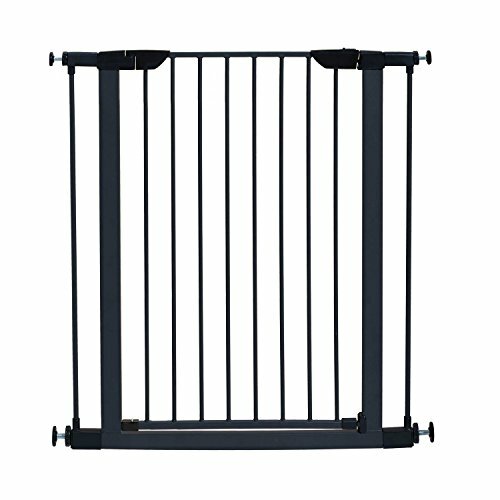 This gate can fit openings from 29 to 44 inches, with extenders available if you need to fill a wider gap. It’s all but guaranteed your puppy will have an accident or two so it’s a good idea to buy and lay down a plastic tarpaulin sheet underneath a play pen and crate if you use them. This will keep mess off your floors and carpets and make the clean up process so much easier for you when the inevitable accidents happen. 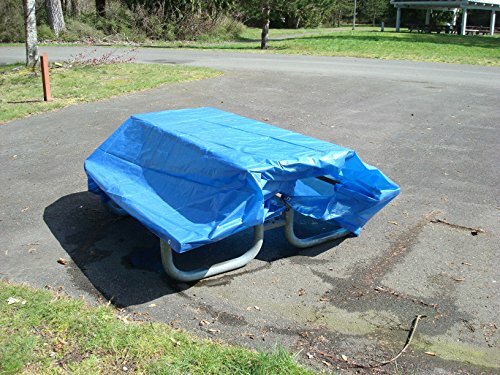 A tarpaulin sheet is cheap and it will soon pay for itself in terms of time saved not having to thoroughly clean hardwood or carpet. Click here for info on various size sheets available from Amazon. Puppy pads or a litter tray are essential as your puppy’s bathroom spot if you’re going to train them to toilet inside. But they’re also essential for those training their dogs to bathroom outside. For the unavoidable times you have to leave your puppy home alone too long to expect them to hold their bladder, you should train them to use puppy pads placed inside of the room you restrict them to. Otherwise, where else are they going to potty? Because until they’re fully house trained at 6 months+, there will be times that they’ll have to. 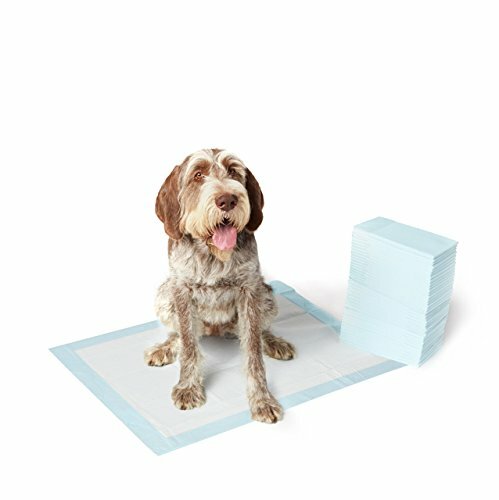 Puppy pads are a soft absorbent pad that you encourage your puppy to eliminate on so it’s all caught and easy to clean up, as well as keeping your floors and carpets clean. Puppy pads come in a variety of types, many of which are scented to encourage your puppy to want to eliminate on them. The scents available range from grass, to ammonia, to specially formulated pheromones, all smells that are known to encourage a puppy to wee in that spot. The scent is weak enough that we cannot detect it, but a dogs sensitive nose easily can. These ‘all absorb’ puppy pads are seeped in attractant to encourage your puppy to use them, have a built in odor neutralizer and turn urine into a gel with each pad being able to hold 3 cups of water! With 100 in the box for a comparatively low price, these are some of the best value and best performing pads available. Although puppy pads can be used as is and placed right on the floor, they can also be placed in holders that resemble a tray. These have raised edges to help make sure that all the mess is caught and doesn’t spill over on to the floor. 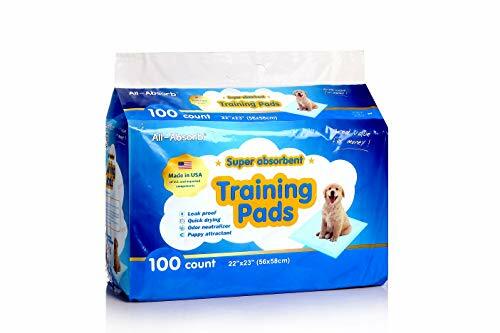 Unless you intend to train your puppy to toilet indoors full-time, only use puppy pads sparingly because allowing them to toilet indoors only occasionally is very confusing to a puppy. They learn quicker and do better living to very black and white, ‘yes or no’ rules. 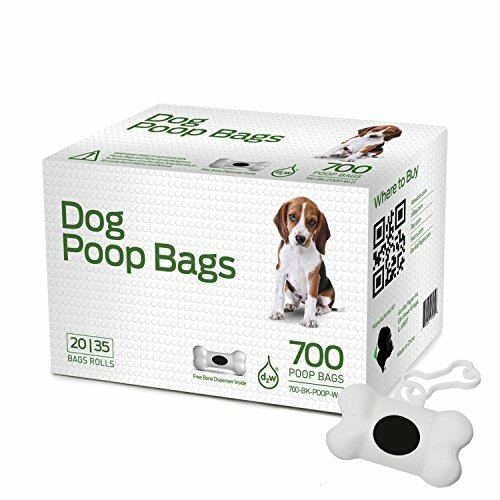 Try to use them only when leaving your puppy alone for so long that they won’t be able to hold their bladder. Otherwise make sure they get plenty of breaks outside for regular pottying and try not to use pads at all. But it’s a very good idea to have some in reserve, just in case. Could You Use A Litter Tray? For those wishing to pick an indoor bathroom spot there are litter trays available, much the same as you can buy for a cat. The problem is some dogs just cannot help themselves when it comes to either eating the litter or in some cases scratching at the litter and sending it flying around a room, much like you see some dogs do on grass when they potty outside. This happens far, far less with puppies trained to use pads. However, litter is very easy to clean up and the high sided walls on a litter tray do help to contain the mess and help a dog ‘hit the target’ more easily as they have to step inside. So they do have their benefits. After your puppy has eliminated you obviously have to clean up the waste. For indoor trainers that’s easy, either clean or just roll up and throw away the puppy pad they eliminated on. Or for ‘accidents’ indoors, pick up or soak up the waste with a plastic bag or some tissue and flush it down the loo. But when your dog goes to toilet outside you need a way to pick up and dispose of their mess easily and hygienically. For this you need at minimum ‘poop bags’, and maybe a ‘pooper scooper’ too. ‘Dog poo bags’ are simple are use, keep the environment clean and when used properly enable you to pick up mess with it never coming into contact with your hands. To use you put your hand inside the bag and using it like a glove, pick up your pooches waste. You then take the top of the bag and still gripping the bottom and the waste, turn the bag inside out by sliding it down and over your hand until the poop is now inside and your hand on the outside. You can now tie it closed and dispose of it with everything now safely inside and you haven’t had any of it come into contact with your hands, they are still nice and clean. Click to see some incredible value, bulk buy deals from Amazon. Pooper scoopers are for most people (and certainly for me) not the sort of thing you want to take out on a walk. Poop bags will suffice. You can keep your pooper scooper in a hidden corner of your yard, ready for use as and when necessary. They will look a little grim after some use, but keep them hidden away and give them a regular hosing down and they really aren’t too bad and I find them really useful. There are a variety of models of on the market, from a simple shovel, to elaborate one-handed operation suction type devices. The one you choose depends on the type of your yards surface and your particular tastes. Personally, I would recommend a scoop and spade for those with a solid patio, and a scoop and rake for those that need to pick up poop from grass. The more elaborate models are an unnecessary expense and with their extra moving parts and sometimes complicated designs, they don’t last as long and need more effort to clean. Also, for those occasional times your dog’s poop is softer or runny, the one-handed contraptions aren’t very effective and you will need a shovel and scoop for these times anyway. Buying both is just unnecessary expense when you can easily get away with the simpler models to cover all occasions. The most important part of house training in a positive way is to reward your puppy lavishly when they do something right. This means rewarding them when they toilet in the right spot, be that outside or at an indoor spot you’ve chosen for them. If a puppy gets lavishly rewarded when they do something, they will try to perform that behavior more, trying to earn that same praise. This is the cornerstone of most modern, positive, reward-based training techniques. So how do you reward your puppy? All dogs love working for food and Labradors with their well-known appetites particularly so. Therefore a high value treat is perfect to use during house training. 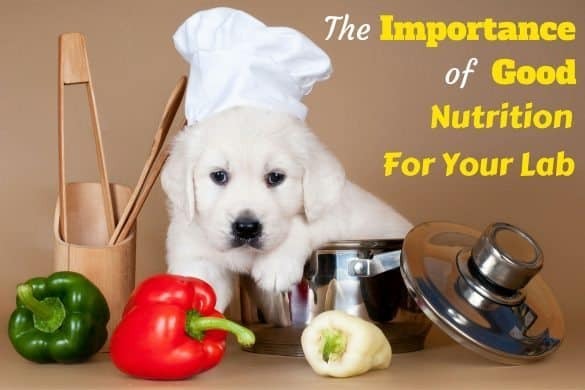 Now of course, you really want to feed your puppy on a schedule and only a set number of calories per day. Treating with food rewards has the potential to upset this carefully laid out plan. 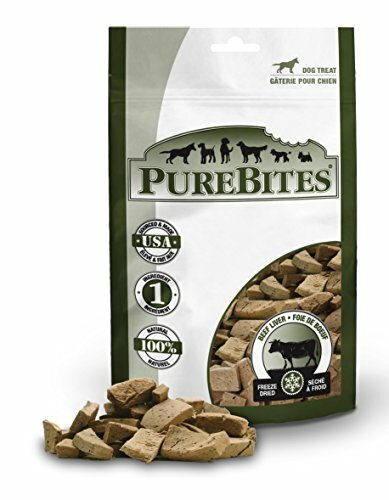 So you want to use a high quality, low-calorie (low-fat and low-carb) treat that your puppy will love and only offer a single and very small piece. Beef jerky or dried liver is absolutely perfect as a high value reward. Be warned too that you should not give a treat every time. Mix it up with lavish praise, or a game of tug, or a nice walk or other form of play for a reward most of the time, and just a high value food treat every now and then. This will prevent over-feeding and also prevents your puppy getting over reliant on receiving the food reward and feeling hard done by if it doesn’t come. It needs to be a gamble and something they only get occasionally in order to be effective. During the clean up process and particularly for accidents in your home, you need to use an effective cleaner and thoroughly get rid of any odors. Any remnants of a scent your puppy can detect will draw them back to eliminate on that spot again in future. You don’t want to use just any old standard cleaner as they can leave some of the original smell. Or worse, they may contain ammonia that smells like urine and the cleaner itself will attract a puppy to the spot to use as a toilet. Enzymatic cleaners – That contain enzymes to break down the proteins a dog can smell. Odor eliminating – To completely eradicate the smell. There’s no use trying to ‘mask’ the smell like many cleaners, you need to ‘eliminate’ it. 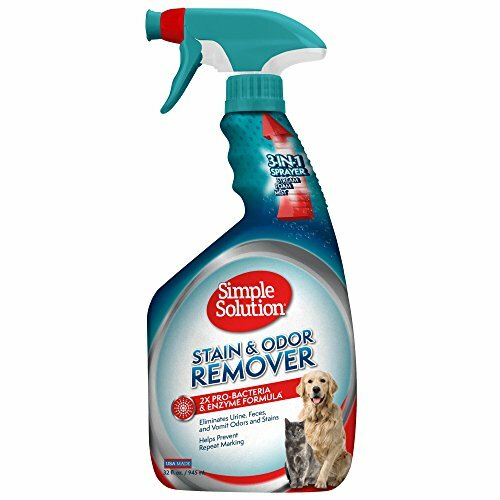 Ammonia and bleach free cleaner – As ammonia containing bleaches share similar odors to urine, the cleaning solution can attract a puppy to a spot to toilet. Click here to see a selection of the best pet stain cleaners from Amazon. 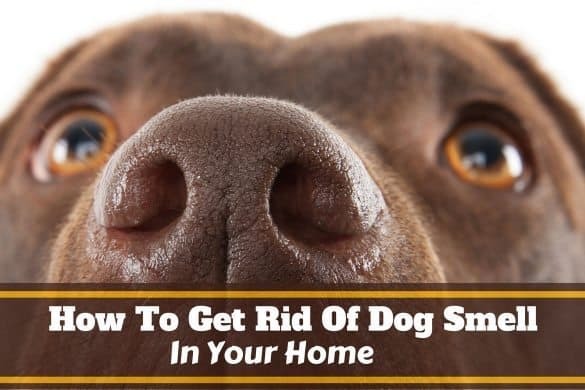 For those of you on a tight budget it is possible to make home-made pet odor eliminating cleaners. A mix of vinegar, bicarbonate of soda and water is the one that pops up regularly. I have to admit that I have never played around with this idea and think the little expense of purchasing a proven and effective commercial cleaner is a worthy investment. Sometimes you can smell there’s been an accident, but you cannot figure out where. And often people or your puppy can tread just the tiniest amounts of urine into the house and on to your carpets. Just these tiny flecks are more than enough to attract your puppy’s exceptionally keen nose to the spot and encourage them to ‘refresh’ the urine smell that’s already there. But if you didn’t see the accident happen and it’s dried, or the tiniest bit of urine was trodden in, how on earth do you find it? The answer is to buy a black / UV torch. Urine contains phosphorus and a few other components that give of a yellow-green glow under UV light. So by investing just $5 to $15 in a UV torch you can very quickly and easily find all and any spots where even the tiniest bit of urine stain remains. Hopefully before your puppy does! 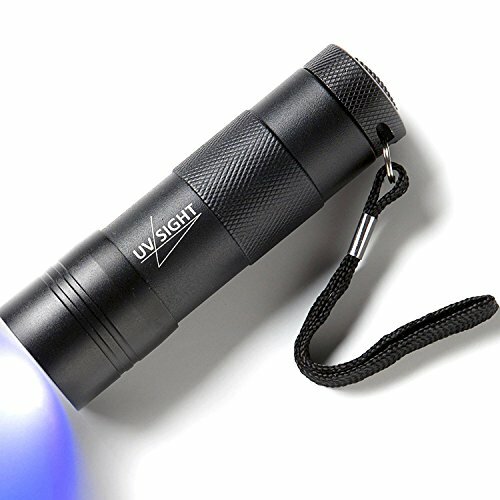 This easy to use, handheld, powerful LED black-light flashlight is all you need to find urine spots and stains in your home. The correct attitude, dedication and patience are the most important tools to have in any house trainers arsenal. You need to bring a cheerful and happy tone to all proceedings. 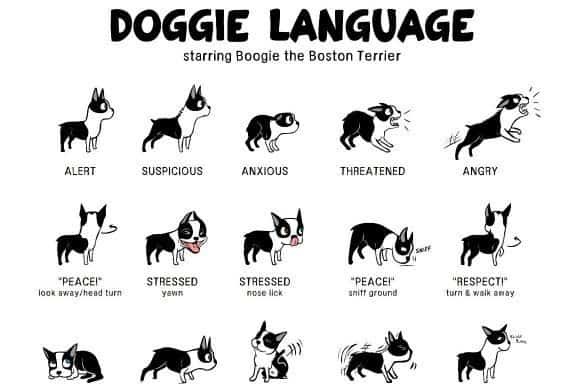 Praise your puppy lots, punish them never, be punctual and dedicated in sticking to a routine and show an abundance of patience and understanding. Please be aware this page contains affiliate links and Labrador Training HQ receives a small commission if you make a purchase through any such links. This has no effect on the eventual price you pay and we are very grateful for your support. House Training: The Ultimate Guide! All of your advice is fantastic! I had no idea there was such a thing as a blacklight urine detector. 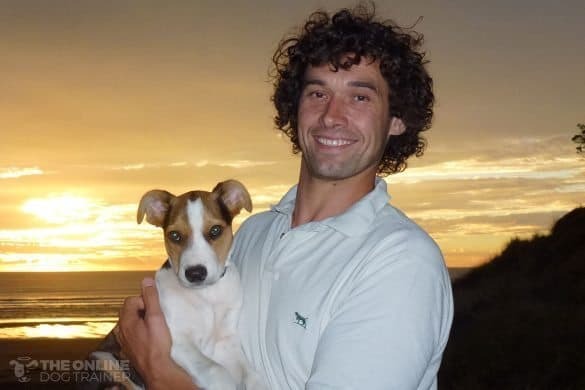 I’m a dog trainer and I often refer my clients to your site for its fantastic writing and thoroughness in explaining dog and puppy training protocols. Thank you for all your good work! Awesome advice. Kudos to your ease of readability and conciseness.